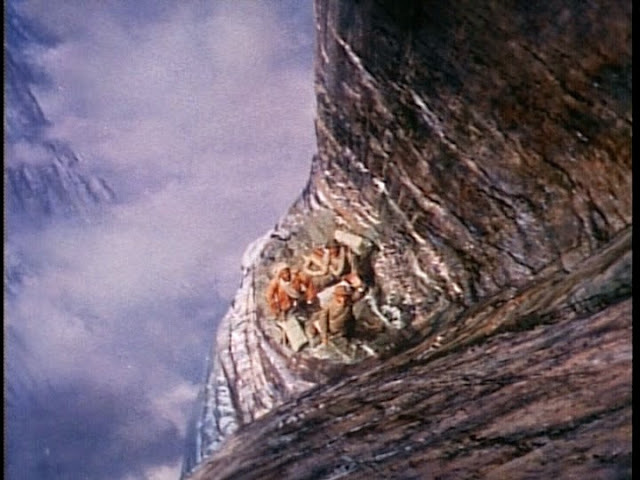 Third Man on the Mountain Walt Disney 1959 – Wonderful Peter Ellenshaw Matte Paintings. These Peter Ellenshaw Matte Shots from Third Man on the Mountain 1959 Walt Disney. 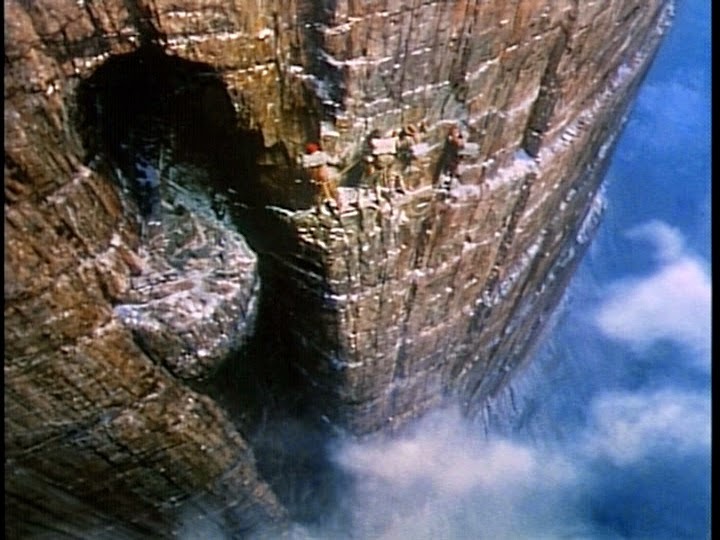 According to Ken Annakin – the film director – in his Autobiography that when the film had a first showing these shots were so realistic that members of the audience had to leave the cinema suffering with vertigo. Just take a look at the pictures and you can imagine why when this was viewed on the big wide screen. Peter Ellenshaw added Disney movie magic to the film, designing matte paintings for scenes like in the above two with dizzying downward shots that would have been impossible to capture with the film cameras. The film starts off with a runaway chariot carrying a damsel in distress, Jole, princess and future bride of Hercules (played by Sylvia Koscina) next we see and hear a tree being uprooted and the next scene we see Hercules carrying the tree and throws it in front of the chariot stopping the horses. The exhausted Jole faints in the arms of Hercules. Later in the film we see Hercules perform the Labours of Hercules, defeat the Cretan Bull, the Nemian Lion and help Jason find the Golden Fleece and then coming to Jason and his Argonauts rescue as they are being defeated by the evil king. We see Hercules pull chains from the wall and then use them as a weapon to defeat the Kings army first by taking out the evil adversaries one by one and then by wrapping the chains around two pillars supporting the Temple and pulling the Temple down, killing the remainder of the Kings men. Overall, a good, fun film. To the critics though, you won’t find a great plot or academy award winning acting but after all, as has been said many times before, people come to the cinema to be entertained. Hercules went on a big box office hit of its time and propelled Steve Reeves into one of the highest paid actors for a short time. In 1957, SteveReeves went to Italy and played the lead character in Hercules a relatively low-budget epic based loosely on the tales of Jason and the Argonauts, though inserting Hercules into the lead role. The film was a major box-office success, grossing $5m in the United States alone in 1959. Its commercial success led to a 1959 sequel Hercules Unchained – a film I remember well from my teenage years – in point of fact I remember this one better than the Hercules film. From 1959 through 1964, Reeves went on to appear in a string of sword and sandal films each shot on relatively small budgets,and although he is best known for his portrayal of Hercules, he played the character only twice. Interesting foot-note though – In Hercules Unchained, Steve Reeves fights with Primo Carnera the former World Heavyweight Boxing Contender – and although difficult to believe he actually won !! By 1960, Reeves was ranked as the number-one, box-office draw in twenty-five countries around the world. 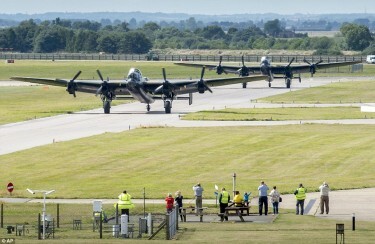 What a wonderful picture this is taken on 14th August 2014 of the last two flying Lancaster Bombers on the runway at RAF Coningsby in Lincolnshire which is very close to their original Woodhall Spa wartime home. 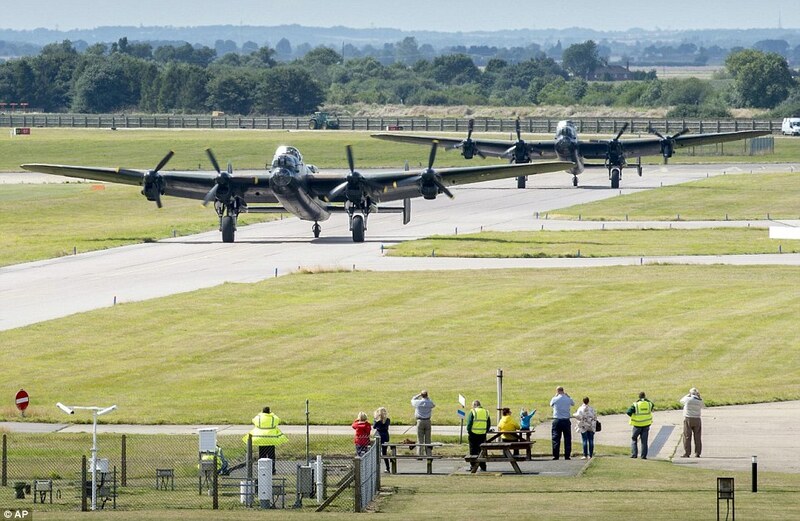 The 1955 film The Dambusters has been featured on here before but this picture just tends to remind us – as the film did so well – what it was really like to see these aircraft lining up to take off. In those days sadly they would be going into danger and many would not return. These two have come back to their home county 70 years later. Lauren Bacall has died aged 89 at her home in New York marking in many ways the end of an era. She had become star in the late 40s following her teaming with Humphrey Bogart in To Have and to Have Not quickly followed by The Big Sleep and Key Largo – a man she later married and with whom she had two children but he sadly died in 1957 after just 11 years of marriage. She certainly hit the ground running with these Warner Brothers films thus ensuring her status in the great Hollywood era that by this time was almost at an end as we had known it. However as this Blog is about Fifties films, one I will remember is an British film North West Frontier (1959) which was released as Flame over India in the USA. The film also starred Kenneth More, Wilfrid Hyde-Whyte, Herbert Lom and I.S. Johar as Gupta in a brilliant portrayal as the Indian Train driver who takes un on a thrilling rail ride through India pursued by rebels who want to capture the young prince they are helping escape. It wasn’t the strongest part for Lauren Bacall and the romantic storyline for her and Kenneth More didn’t seem plausible but nevertheless she was, as she always was , very good but under used. It is a very exciting film with a great railway chase that takes up much of the film. This film is a thoroughly enjoyable historical adventure yarn set in colonial India, directed with great tempo and suspense by J Lee Thompson. 1905, British officer Scott (Kenneth More) comes to the aid of six-year-old Hindu Prince Kishnan (Govind Raja Ross) and his governess Catherine (Lauren Bacall) whose lives are threatened by an uprising of rebel Moslem tribesmen attacking a British fortress. 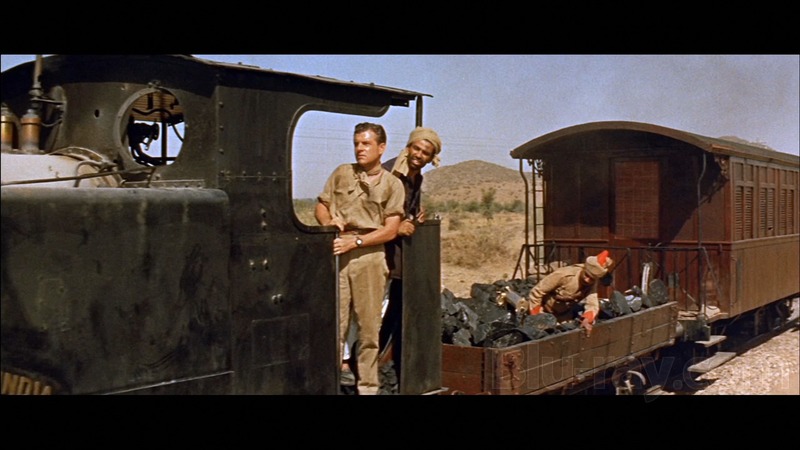 Captain Scott commandeers an old steam locomotive, the Empress of India, engineered by the sincere Gupta (I.S. Johar) they embark on a perilous 300-mile journey across enemy territory to the safety of Kalapur. Also along for the perilous ride are gentlemanly English diplomat Bridie (Wilfrid Hyde-White), cynical journalist Van Layden (Herbert Lom) and arms dealer Peters (Eugene Deckers), as they journey through a massacre, repair broken rails, traverse rickety bridges and evade marauding tribesmen. A sinister moment when the young prince is encouraged to dangerously play with a spinning flywheel gives forewarning of a traitor in their midst who might prove their biggest danger. Kenneth More and I.S.Johar – On The Train. Lex Barker was married five times. 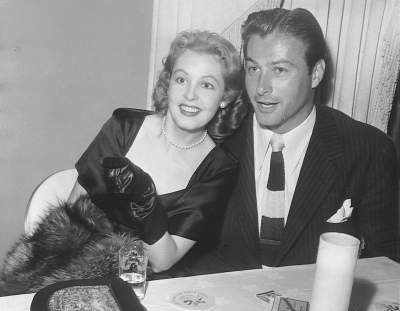 Although his second marriage with his colleague Arlene Dahl turned out to be the shortest, the relationship cannot at all be described as unhappy. The careers of the two Hollywood stars and the changing studio systems of the 1950s in Hollywood didn’t allow for a longer family life. With her titian-red hair, Arlene Dahl counts among the most attractive actresses of the motion picture city, promotional slogans describe her as: “the most beautiful woman ever seen in a movie”. Her talents, however, are not restricted to the (superficial) beauty on screen and stage. After authoring eighteen books thus far, the versatile artist and mother of several children distinguishes herself through her columns on beauty and astrology for daily newspapers, as well as her talents as a businesswoman outside show business. Arlene Dahl grew up in Minneapolis, Minnesota. Her parents were both Norwegian and Arlene speaks and also writes that language. While still very young, she went to work at her hometown radio station, and later, via Chicago, arrived in New York. While she participated in a Broadway musical, Arlene Dahl was discovered for the motion pictures. She acted alongside Van Johnson, Dennis Morgan, Red Skelton, Robert Taylor, Rock Hudson, Bob Hope, and Fernando Lamas. She impressed the directors with her talent for comedy, and on top of it was then, and still is very photogenic. The actress is socially active in New York and is presently writing her autobiography, planned for publishing in 2008. The following interview was conducted in 2007 and is published here for the first time. Mrs. Dahl, you and Lex Barker were part of “classic Hollywood”, the studio system. When you look back at it, what memories do you associate with that era? Hollywood was glorious in those times — glorious, glamorous, and magical. The studio system spoiled actors and actresses under contract. Metro Goldwin Mayer (M.G.M. ), of course, was the leader of the pack. They spoiled all of their contract players, and all of the stars and co-stars. And Lex, I believe, was under contract with R.K.O. Lex got spoiled at a smaller studio. No, absolutely not. The break with M.G.M. came because L.B. Mayer, who was my mentor, left the studio. Dore Schary replaced him. And Dore Schary was what we knew in Hollywood terms as a “kitchen sink” mentor. He came from R.K.O. He was a writer and made black-and-white films. But Cinemascope, Technicolor and Musicals were not part of his genre. I made three black-and-white films, which Mayer said I shouldn’t do. But nevertheless, Dore Schary put me in them. I asked my agent to get me out of my contract, which she did. It happens. It collided with my marriage to Lex. When I came back from my honeymoon in 1951 with Lex, Mayer had been fired. Let’s go back to the beginning of your career. You’re originally from Minnesota. Do you have an artistic vein? Well, I was always interested in portraying other people, as well as myself. From the time I was a small child. The woman who lived with us, our maid at the time, was also interested in that business. I was taking dancing and singing lessons. She put the girls whom I was dancing and singing with into a review called the Hollywood Review. We’d work on weekends, in different clubs to make a little extra money. How did things develop from then on? I was on a radio show on Saturdays together with a little boy who was about my age. It was called Doctor Bob. We “visited” different places in the world and our audiences loved the broadcast. I also took part in school plays, and in musicals. Then I went to Chicago where I worked as a model. Yes, but they separated and when mother died, I moved back to my father. I had graduated from High school when I was fifteen and intended to go to the University of Minnesota. When my father re-married my stepmother did not want me around. She made it possible for me to go to Chicago. [laughs] There I was, working as a model and living with three roommates in Chicago. They worked with me also in the Sportsman Show in Minneapolis. I was a model in Chicago for a month or two, and assistant buyer. And it was my boss who took me to New York for the first time as a buyer. During my trips to New York I had some time off. I bought a newspaper, Variety, which wrote about the musicals on Broadway. I had studied musicals and singing at the Minneapolis College. And, so I went there on occasions, out of the blue. [laughs] I don’t know what made me do this. But I did it. I decided to take a chance. I was in New York, so why not? I got up and I sang… and I got the part. I got a principal part on Broadway in that musical Mr. Strauss goes to Boston. Jack Warner discovered me. I came to Hollywood to make a screen test for Warner Bros. after Jack Warner had discovered me during the opening of the musical. I got a very interesting part, in which I was going to sing again. [laughs] Yes, L.B. Mayer didn’t want me photographed in black-and-white at all at the studio. Most of my films were then in Technicolor. No, it was not. I think the publicity department of Warner Bros. wanted to put me in something, to announce that I was under contract to Warner Bros. and I would be in a film called Life with Father. But Jack Warner said: ‘No, I don’t want her in Life with Father. I want to introduce her in a bigger film, in Technicolor.’ That movie was My Wild Irish Rose. Three months after I signed my contract I played the lead, Rose, in My Wild Irish Rose (1947). You began with a lead role? Yes, my debut as an actress and a star in Hollywood was playing the lead opposite Dennis Morgan. I did not appear in Life with Father. How would you describe your contact to Jack Warner? It was business contact only until I left for M.G.M. He would never have social contact with the performers who were under contract to him. It was only after I was under contract to M.G.M. that I was invited to his house for dinner. During that time you didn’t only appear in coloUr movies. Ambush (1949) for example, was a western in black and white. Yes, after that Mayer said that he was looking for Technicolor pictures. Ambush was the last film by director Sam Wood. He died shortly thereafter. The location on that film was very difficult. And he was not a young man. The film was shot outside of California in Utah. But I didn’t go on location. I only filmed on the sets at M.G.M. You filmed together with Robert Taylor. What kind of experience was that for you? Oh, it was fantastic. He was such a wonderful gentleman. I told him that two years before, when I was in high school, I had written to M.G.M. asking for a signed photograph. Now I’m playing his leading lady. We both had a good laugh at that. And the next day in my dressing room there were two dozen yellow roses, which were my favorite flowers, and a special signed photograph of him with very nice sentiments in a sterling silver frame. Yes, that was wonderful. I think Fred Astaire had a lot to do with that. I hadn’t sung yet. Even though I’d been on Broadway I hadn’t sung in any musical. Actually I thought when I got my first part in the film with Warner Bros. that I certainly was going to sing. But Dennis Morgan had all the songs. So this was my first musical after leaving Broadway. You have some beautiful songs, such as I love you so much or You smiled at me. Were the musicals always special to you? I wanted to be a musical comedy actress on Broadway. When that was impossible, I embraced the fact that I could sing and dance in films. I appeared at the Palace Theatre on Broadway. I finally realized that my dream I had as a child in Minnesota had come true. I was very dejected when L.B. Mayer left M.G.M. because he was my mentor. I asked my agent, a fantastic agent in Hollywood, to get me out of my contract and he got me a three-picture-deal with Paramount. Were these exotic adventures all made entirely in the Hollywood studios? Correct. The only adventure that I had outside the studio was when I did The Outriders (1949) with Joel McCrea. We went to Kanab in Utah. Unfortunately there were only cameramen who went there to film the background [Paramount productions], but the actors stayed in Hollywood. I’m sure you can tell a few anecdotes around the shooting of these films? I’m saving these for my book. I’m writing my own autobiography. I can understand that. We look forward to your memoirs. Do you realize that those Paramount pictures are still shown on German television? I get a lot of fan mail from Germany, from Russia and all the places in Europe and of course from South America. Is Lex Barker’s name mentioned in the fan mail? Absolutely. They thought we were the “ideal” couple. Well, it’s an endearing term. And I don’t believe it! But it’s a very nice compliment. What else can you tell us about your film partners, for example Bob Hope? Bob Hope was very funny to work with, very supportive. He taught me how to take a “cat nap” and tried all of his funny stories out on me. He had a television show and used the jokes on me. And then he told me how to relax in between setups. He said: ‘I don’t sleep well at night, so I’ve learned to take cat naps.’ I asked: ‘What is a cat nap?’ We were sitting next to each other in our director chairs. He said: ‘You just close your eyes, but your arms rest on the chair. Unfold your legs.’ It was a Yoga-like trance that he went into. ‘Relax.’ He described how he concentrated on his legs, and gradually moved his concentration up his body. He let his body relax, let the tension out, and was asleep. He had his director’s assistant who woke him up five minutes before he was supposed to be on set. He taught me how to do these exercises. And I can take a brief nap, five or ten minutes, and feel rejuvenated. And that’s what I learned from Bob Hope. Interesting! What about Rock Hudson? Rock Hudson was like the brother I never had, you know. He came from a Swedish background. We would talk, off the set of course, in Scandinavian, up and down and up and down, and with an accent. He had a wonderful sense of humor. We laughed very much on the set of Bengal Brigade (1954). Did you meet John Wayne? Oh, of course! He was very nice. He had a drawl that he didn’t save just for the movies. He actually spoke that way in real life. Yes. Rocky was very sporty. I saw my first tennis match with Rocky and Lex. It was at the Country Club in Studio City. You made many other friends in Hollywood? Fred Astaire was a good friend, and Clark Gable and Joan Fontaine. I mention all of them in my book. Yes, he was known for being bombastic and temperamental. But Lex was not always easy going either. Lex had a temperament as well, but different. It would take a lot to get him angry but when he got furious, he “visited Mars and Jupiter”. Everything was forgiven after that. It took him a very short time to forget and forgive. Fernando liked to slam doors. Did you visit Fernando’s homeland Argentina with him? I went to Argentina, but only with his son Lorenzo and my daughter Carole because Fernando was not allowed to return to the country. 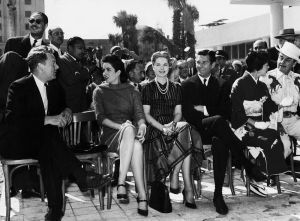 He had an affair with Eva Peron, the wife of the dictator. It was a short affair because when Eva’s husband found out about it, he wouldn’t allow him back in the country. He came to M.G.M. for a screen test, which I made with him. They decided to sign him. Otherwise I don’t know where he would have gone. Probably Mexico. Yes. That was originally made for Co-star Records. They took it off for a performance for Lux Video Theatre. I played the Ingrid Bergman role from the movie. During 1956 and 1957 you made two films in England. How did that come about? That was the time when actors and actresses liked to work there because they got a great deal with their money without having to pay American tax. For tax reasons a lot of the stars went abroad for these movies. Yes, with the best directors. My best part was in Wicked as They Come. That was the best role that I think I ever had in movies. But it was a black-and-white. Both of these were in black-and-white. They didn’t believe in color in Europe. Those kind of movies that were mysteries… they liked to shoot them in black-and-white. We went on location for three months to “the center of the earth”, to Carlsbad Caverns in New Mexico. I had a part not only with James Mason and Pat Boone, but also with a duck named Gertrude who had two understudies. The duck got tired so we had to rush in another duck. That was a very tough shoot, because I had just given birth to Lorenzo. He was about six months old. I left him with a nurse, who had originally been our cook. I hated to be away from them for such a long time but I kept in touch, of course with telephone and so forth. That film wasn’t an easy shoot. It was dirty, and difficult also to tread down every day to “the center of the earth”. And then up the mountain — it seemed like a mountain anyway, coming up from “the center of the earth”. And I almost lost my life — I was hit by one of these big water “sloppers”. That was when we came back. We did a scene at the 20th Century-Fox studio. They had rigged up 25 gallons or 50 gallons of water. They were supposed to hit my back with the water and instead they mistimed and hit me in the face and I got a bit washed. It was quite a scene! My grandchildren all loved that film. I sang and danced. I retired [from the movies] to be the star in the Flamingo with three boys. I became the fourth boy. We did a motorcycle song and other things. Life magazine photographed me. It was a big success. I was there for four weeks. I don’t gamble and it wasn’t something that I really wanted to do, but my daughter and Lorenzo came up to visit on weekends. The nurse would bring them to Las Vegas. I loved working with the boys — I loved working on the stage. But during the day it was dreary because I didn’t gamble. And there wasn’t anything else to do. Now they have everything in Las Vegas and families can have a good time. I could have my family with me if I had to do the show today. During the time I was working in the Flamingo there was nothing to do if you didn’t gamble during the day. I wrote my columns. Three times a week I had a beauty column that appeared in over a hundred papers. My secretary used to fly up and we did my columns together. That’s about the only thing that I could do. Did you at least encounter Frank Sinatra in Las Vegas? You knew Marlene Dietrich from Hollywood already? I had only met her once or twice before at Paramount during wardrobe fitting. She did many films at Paramount. So we met at the dressing room and became friendly. She reviewed my show like the best friend I ever had. She was not known to like women all that much. She was more a men’s woman. I also did a soap in America. From 1981 to 1984 I was with the ABC on One Life to Live. I was playing a character from Dallas with a southern accent. We were filming every other day for four years like they do for the Mexican telenovelas. They are very popular in America. You shoot a whole hour in one day. It’s very difficult work, but I enjoyed it, because I enjoyed playing these characters. Apart from your film work, you have also designed fashion and even created perfume? Yes, I had a fragrance, which I called Dahlia. That was launched in 1976. Yes, I was writing books and was very busy. My first book came out in 1965 and the title was Always Ask a Man. I have done three or four Larry King Live. Last Friday night I was honored for my work in motion pictures. It was a very big thing with about seven hundred people there. It’s great that your motion pictures have not been forgotten! Well I get over a hundred letters a month from around the world, sometimes two to three hundred that I answer personally. What are your thoughts about today’s Hollywood? I think Hollywood has lost its glamour. The young movie actors and actresses coming up, they are what Dore Schary would have called “kitchen-sink” actors and actresses. Meaning they’re at the “kitchen-sink”, they dress as if they were washing dishes in their jeans, in their T-Shirts, they don’t wash their hair, don’t pay any attention to how they look. Or they wear only underwear. It’s just appalling what happens. I wish for the old Hollywood to come back. So that all the would-be stars would learn how to act, would learn how to conduct themselves in public and respect themselves more. Your son Lorenzo is also an actor. You must be proud of him? Very much so. And not only proud of him with what he accomplished, you know, he is a television star, but he has also made movies, of course. I am also proud of him as a father. He has three little girls so he can’t stop working because he has to support them. One is four, one is six and one is eight years old. And he sees them every weekend, takes them here and there. He is such a good father. I’m really proud of him! Last November he opened with his first singing engagement in New York. His reviews were fantastic. He had such a wonderful time. The critics compared him to Dean Martin, Julio Iglesias and Hugh Chapman. He is receiving some offers from Broadway; also for more singing engagements. So I’m very happy. Yes, unfortunately. If he lived a little bit closer I would approach him about keeping up his singing, because he has such a beautiful voice. I introduced him to a voice coach when he was very young because he told me he loved to sing. And I said: ‘Well, if you sing you have to learn how to produce the sounds that you want to hear.’ I introduced him to the first coach who trained him in classical arias because he has a voice for opera, it’s very strong. He’s a wonderful boy. Christopher made three compact discs, but not the kind of discs that I wanted him to make, which were the German operetta and musical comedies. If he sang them I would be proud about that! Do you believe that he’ll make a comeback one day? I have no idea. I keep asking him: ‘Are you exercising your voice?’ He says: ‘Yes, when I have time to do it.’ I’m not sure if he has enough time to do it. But I’m always there asking. I hope he will make a comeback. Yes, we were reading many scripts that we thought we might do. Fire over Africa was made with Rhonda Fleming. But the first choices were Lex and I. But I was making another film at Paramount. I couldn’t do it. And Lex had another film that he was doing with Sol Lesser. They didn’t want to wait for us. So they re-casted. What do you think about Tarzan? I thought it was fabulous that he was Tarzan. He got me exercising with him every day. He had a fabulous physique, he was very proud of it and he worked a lot to keep it that way. I didn’t see him in the studio as Tarzan and I couldn’t go to be with him in Africa because I was making films under contract — I had just signed a contract with Paramount. When he came back I was filming every day in the Paramount studios. All of this worked against our marriage. Looking at the book Tarzan and Hollywood you saw many familiar faces again. What can you say about producer Sol Lesser? Sol gave Lex a bonus that he could use for his honeymoon. Sol Lesser was not very generous with his contract with Lex. I never asked Lex how much he was making. He certainly wasn’t making a lot of money, even though he was the star of Tarzan. Sol Lesser was not very generous that way, but because of all the publicity and everything he gave the bonus to Lex to use for the honeymoon, which I thought was very nice, of course! But I met Sol Lesser on various occasions. He never gave parties or anything like that, he was a businessman. The bottom line was the most important thing for him. Lex wanted me to go with him to Africa. I don’t know if Sol Lesser would have picked up the tab or not. It never came up because I was just put under contract for three pictures to Paramount and one of them started almost immediately. I never had a chance to go to Africa. I think had I gone to Africa we would probably still be together. Who knows? That’s life! Have you ever met Johnny Weissmuller? How was he different compared to Lex? Completely different. The only thing they had in common was the great physiques. But Weissmuller was not as social as Lex. He didn’t go out very much. He was a very nice man, but he was not very social. And he didn’t go to the big Hollywood parties and so on. The last question: what place does Lex Barker hold in your life today? I only have to close my eyes and I can hear his voice in my mind. Lex is already and always a part of my life. 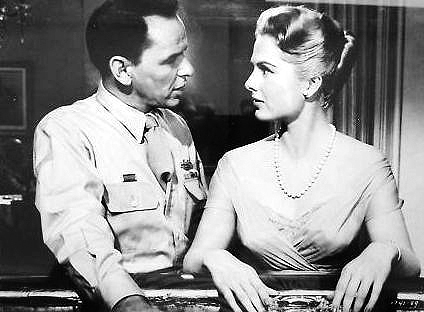 Martha Hyer and Frank Sinatra in Some Came Running. Martha Hyer, one of the last studio glamour girls of the Golden Age of Hollywood, died May 31, 2014 at her Santa Fe home. She was 89 and had lived in Santa Fe since the mid-1980s. A striking blonde who once turned down a date request from the young Sen. John F. Kennedy, she was nominated for an Academy Award as best supporting actress for her work in 1958’s Some Came Running, an MGM film starring Frank Sinatra, Dean Martin and Shirley MacLaine. She lost to Wendy Hiller, for her role in Separate Tables. 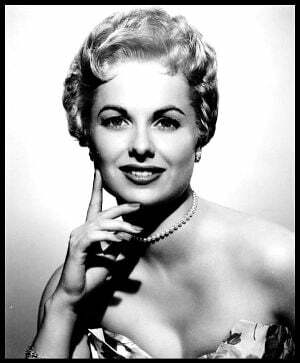 Although she put on a good face during the remainder of the Oscars show, Martha Hyer later recalled that she went home and cried all night. The Oscar nod did not help her career though, which started with a three-year contract at RKO in the early 1940s and ended with a series of forgettable cheap films made in both America and Europe. She was born Aug. 10, 1924, in Fort Worth, Texas.. In her 1990 autobiography, Finding My Way, she described her childhood desire to be an actress and her love of film. “Movies were magic, our passport to outside,” she wrote. For several years, she was unable to secure a toehold in Hollywood, although she worked in everything from Abbott and Costello Go To Mars to the B-adventure Yukon Gold and the African safari film The Scarlet Spear. She married the latter’s director, C. Ray Stahl, but the marriage quickly ended in divorce. Her first big break came when she was cast as William Holden’s fiancée in Billy Wilder’s 1954 romantic comedy Sabrina, which starred Audrey Hepburn and Humphrey Bogart. In her autobiography, she recalled Bogart as being helpful and selfless in his scenes with her. However roles in pictures like Red Sundown, opposite Rory Calhoun, and Francis in The Navy, opposite Donald O’Connor and a talking mule, again stalled her career. She worked with Rock Hudson — whom she said was shallow and self-centered — in 1956’s Battle Hymn. In quick succession, she found herself playing straight woman to the likes of David Niven, Bob Hope and Jerry Lewis in films that spotlighted their characters, not hers. She liked David Niven and Bob Hope, but not Jerry Lewis. Some Came Running brought her critical acclaim. She wrote fondly of the experience, noting that MacLaine was “brilliant,” Sinatra “never better” and Martin “marvelous.” MacLaine received a best actress nomination for her work on the film. Mostof Martha Hyer’s 1960s films were weak, including Bikini Beach, House of 1,000 Dolls and Picture Mommy Dead — “all ones I’d rather forget,” she wrote. She did secure a supporting role in Hal Wallis’ 1965 production The Sons of Katie Elder, but she again played second — or in this case, fifth — fiddle to a cast topped by John Wayne and Dean Martin. She married Hal Wallis in December 1966. In her autobiography, she reflected on both his strong points and his weaknesses, including his tight-fisted approach to spending. By her own admission, she became caught up in the high-living culture of the Hollywood lifestyle and began overspending. Shortly after she penned a first-person account of her lifestyle in a 1959 Life magazine article, she came home to find her Hollywood home robbed of all its goods. She later managed to pay ransom money to get some of her paintings back. Hal Wallis, as well as some lawyers and the FBI, helped Hyer work her way out of her financial mess. She had visited New Mexico when Hal Wallis was here filming Red Sky at Morning, the 1971 movie version of Richard Bradford’s 1968 novel. “The Indians say Santa Fe is sacred ground. I believe it,” she wrote. Hal Wallis died in 1986, and Martha then moved to Santa Fe shortly thereafter. “This country casts a spell and it never lets go,” she wrote. She did become somewhat of a recluse in her later days, preferring to paint, hike and spend time with close friends. “When you live with fame as a day-to-day reality, the allure of privacy and anonymity is as strong as the desire for fame for those who never had it,” she said. A film I like very much and Made in England at that is First Men In The Moon 1964 starring Lionel Jeffries, Martha Hyer and Edward Judd. Martha Hyer in a publicity still from the film.